The Additional CSS Panel provides a really powerful tool for applying simple CSS changes and seeing the effect immediately. This is a really useful feature to test different style with various CSS code in real-time preview. 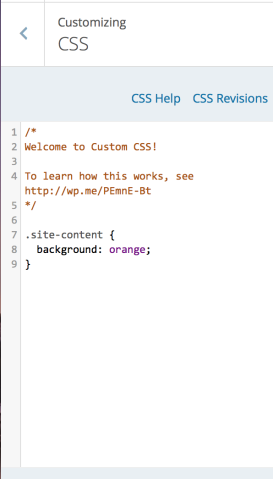 Open the WordPress live customizer and navigate to the custom css setting. Just remember to click the Save & Publish button to keep your changes. If you modify a theme directly and it is updated, then your modifications may be lost. By using Custom CSS you will ensure that your modifications are preserved. Using Custom CSS can speed up development time. Custom CSS is loaded after the theme’s original CSS and thus allows overriding specific CSS statements, without having to write an entire CSS set from scratch.